At Psychic Readings by Rose, our attentive staff is available Monday - Sunday to answer your questions and ensure you are 100% satisfied. ​Serving Ulster County, Manhattan, Upstate New York, the Hudson Valley, Rhinebeck, Rhinecliff, Red Hook, Catskill, Hudson, Athens, Hyde Park, Hunter, Phoenicia, West Hurley, New Paltz, Newburgh, Dutchess County, Columbia-Greene, Orange County, Putnam County, Poughkeepsie, Ellenville, Wappingers Falls, Fishkill, Rye, Port Chester, Rochester, Buffalo, Shokan, Albany, Long Island, NJ, CT, PA, MA, RI, VT. Available for gatherings, parties, banquets, events, corporate functions, Home and Shaman/ Energy cleansing. Body, Mind, Spirit, Soul, Heart. Book your consultation with Rose by filling out the contact form below. 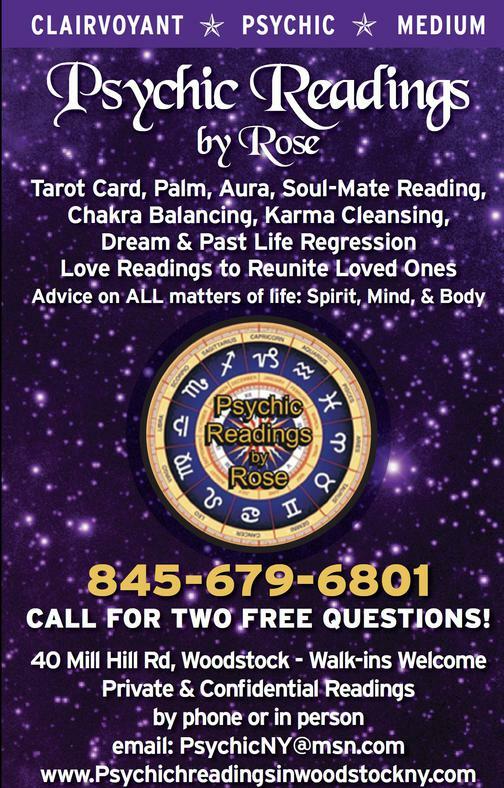 Copyright © 2011 - 2019 Psychic Readings by Rose © All rights reserved.